Recently I was channel surfing and came across this program that was talking about celebrity skin care. The host was a 20 something girl with what looked like already beautiful skin. She was talking with a skin care specialist who was telling her about celebrity skin care secrets. He shared with her that a week or so before a big celebrity red carpet event like The Oscars or The Golden Globe Awards most celebrities undergo a skin treatment called microdermabrasion. This was described as a treatment that uses a minimally abrasive instrument to gently sand the skin, removing the thicker, uneven outer layer. He went on to say that it uses micro particles, or a diamond-tipped wand, to slough off the top layer (epidermis) of your skin and stimulate new skin growth. To me images of someone holding an industrial strength-sanding machine to my face came to my mind. I wasn’t sure I wanted to keep watching but my curiosity got the best of me. After a few more minutes of him explaining the procedure he went to work on the hosts face. He used a hand held device with a rotating diamond tip to work on the skin on her forehead, around her eyes, by her cheeks and near her chin. Not once did she mention a pain or discomfort. She said it was a bit tingly and that was about it. After the treatment he applied some special moisturizing skin cream to her face and she looked great. Her skin was glowing and radiant. She looked like she was ready for the red carpet. After seeing this I was wondering if there were any devices out there for the everyday user. I did some searches online and found one company that came highly recommended. 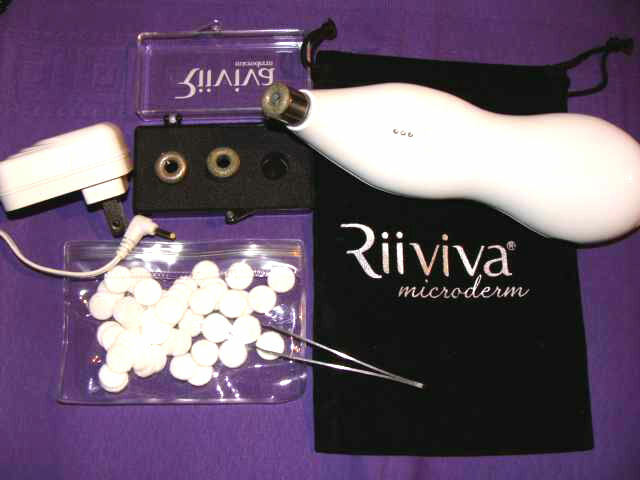 They are called Riiviva and they offer at home microderm kit for the everyday user. They sent me one of their kits to review and within a week I was sitting in my living room watching the how-to video while the unit charged ( I had to charge it for 24 hours before 1st use). Their microdermabrasion device is equipped with medical-grade diamond-tip technology. The fact that it was rechargeable and could be used on the go was a big plus for me. The kit came complete with three types of diamond tips for face: fine, medium, and coarse, 50 Filters, Tweezers, Black Velvet travel bag and charger. The video suggests that all users start out with the fine tip and see how their skin reacts. Some people have more sensitive skin than others and the fine tip maybe all they ever need to use. While other people may have tougher skin and find they work their way up to the coarse diamond tip. The first time I used it with the fine diamond tip (the one on the left) as suggested. Riiviva suggested that I try it on one side of my face that way I could compare the two afterwards. So I took their advice and only used it on the left hand side of my face. After the treatment my face was slightly red in places but this was perfectly normal according to the how to video. Within couple of hours after using the Riiviva Microdermabrasion device on the left hand side of my face was left feeling much smoother and silkier compared to the untreated right hand side. I have to say I was immediately sold and then went to work on the right hand side of my face. The instructions said that you should use it once a week that way you give your skin a chance to rejuvenate naturally. The face test worked good for me but I wanted to see more some visual difference so I decided to use the Riiviva Microdermabrasion device on the rough part of my legs – my knees. 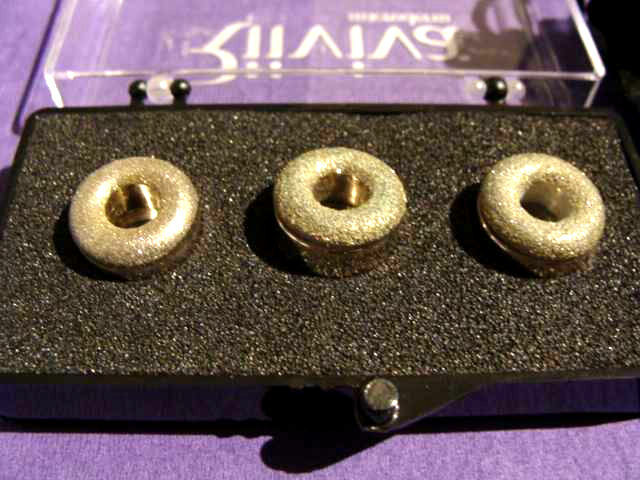 I have used the coarse diamond tip on my right knee once every 3 days. Each treatment took me less than 5 minutes. After the treatment my knee was slightly red but didn’t hurt a pinch:) After each treatment the skin was feeling much smoother and silkier compared to the untreated left knee. It was a feeling as if someone sucked off all of the dead dry skin layers. I was actually very surprised to see when I opened the back of the device to check on the filter, it was filled with dead skin cells. yuk.. 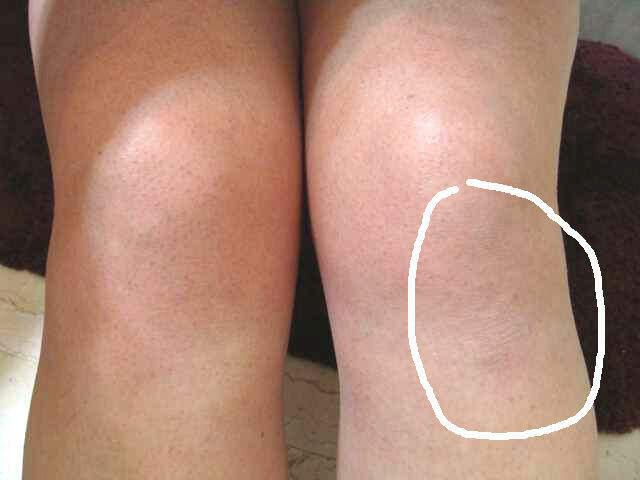 But I’m very happy to notice the look and feel of my right knee. The skin after 2 treatments is much softer and does not have that rough look and feel. Yes I have used Skin polish, exfoliators in the past but they didnt give me these awesome results. I have been using the Riiviva Microdermabrasion device for three weeks now and I have to tell you my skin hasn’t felt better. Along with the Riiviva Skin Care cream that they sell on their website my skin looks and feels much healthier, tighter, and clean. Did it work for me? Yes! 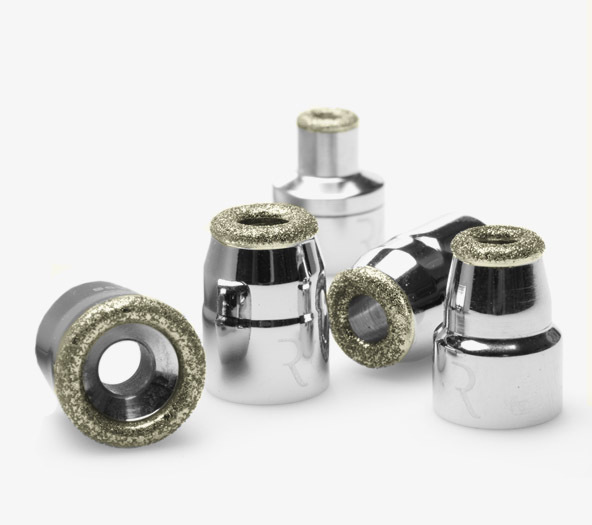 Now that I’m seeing the visual results, I’m looking forward to purchase the bigger diamond tips that are designed to use for body and looking forward to treating more of my other skin parts 🙂 I am really happy that I stuck with that program back when I was channel surfing. Now I use and know all about a celebrity skin care treatment called microdermabrasion. The only con that I’ve noticed is Riiviva Microderm device does not hold charge longer than 5-7 days. I will recommend to take the charger with you if you travel. For the few minutes it takes to use the Riiviva Microderm, and the results it has given me I think it is very well worth every penny. At $299.00 it really is a bargain if you compare the price to getting the same results at a Dr’s. office (You pay $100-300 or more just for ONE 10-15 minute treatment). If you are looking for an affordable at-home option to see how your skin can be refreshed, rejuvenated and visibly look better and to see what other products they sell please visit Riiviva web site. For a limited time you can enter for a chance to win Riiviva Microderm. If you like to purchase Riiviva they generously provided a Coupon to my readers. Use code mdirene-83. $30 OFF Riiviva Coupon. It is valid until April 30 2013. Disclosure: I received the Riiviva Microderm kit for free to test out the product. All opinions are mine and mine alone. Regardless, I only recommend products or services I use personally and believe will be good for my readers. I think this product will be wonderful for my dry problem skin areas! Thank You! this would be great for my bod!! i am glad you didn’t experience any adverse effects. i would be worried about taking off too much skin. 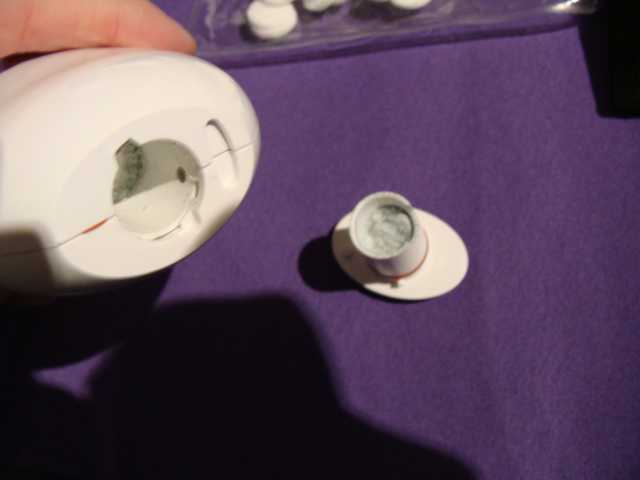 i am always skeptical of these at-home products and their efficacy as compared to having it done by a professional. it seems you were able to do the treatment with ease and have immediate results. i would definitely give it a try. This sounds just what I have been looking for. And to do it at home and not have to go to a salon to have it done. sounds like a wonderful product, and I hope I win because I can’t wait to try it. This looks like it would be perfect for my face! I really like your review. This Riiviva sounds really wonderful. Amazing! I love that it has so many different tips! I would like to try this. Spring is coming up and I feel self conscious in shorts because of my skin. microdermabrasion treatments can cost an arm and a leg. This kit would save me a fortune on area’s of my body that would ultimately cost more anywhere else than I ever want to imagine. Thank you for placing this contest!!! This looks awesome! My skin is super dry right now, I think this would do wonders for me. Great review! It sounds like the perfect product for someone who has just been pregnant with twins! I think it is an amazing product to offer us for home use. I don’t worry to much as it uses micro particles, or a diamond-tipped wand, to slough off the top layer (epidermis) of your skin and stimulate new skin growth. As with anything you just need to follow directions and be very careful. I have horrible stretch marks from three surgeries and this type of product could give me my self confidence back so I would love to try it. Great Review! I’ve never heard over microdermabrasion before and now I am interested in looking into it more. I like the fact that this device helps take dead dry skin of in a painless fashion. As I age I want to look as youthful as possible and this just may be the thing to help me do that. Thank you for the review and introducing me to this product. I’ve heard of these devices but I didn’t know you could use it on other places on your body. That’s awesome. I could sure use this. I have rough patches on my elbows and I could definitely use it for my face. It’s amazing what results you received using this. You have me sold. I think this microderm Riiviva would be great to remove scars that are unwanted. It would also make you look younger with the outer layer of skin removed to leave soft, subtle skin. Great product. Oh wow! I totally need this for problem areas on my knee and leg as well! Thanks for the awesome information! this looks like a wonderful product and fairly easy to use. would be really great for my face. Sounds like a great product! My skin is rough and uneven in the winter and this sounds like it would really help! I never thought you could use this on more than just the face. I might try it on other areas like my knees also. I like the idea that you used it on half your face just to see if there was a difference…how else would you be able to check how soft it was. That was a great idea! This sounds amazing and I don’t have to go to the salon, the salon is in my bathroom. Wow. Sounds like its to good to be true. I would love to try it and see if it helps my face. Thanks for sharing. I would love for my skin to look bright and radiant again. As a domestic violence survivor, I suffered several facial injuries and arm injuries. This sounds like just the thing I need for my skin. I am 53, but I want to look younger!! YOU DID A VERY GOOD REVIEW. I WOULD DEFINITELY WANT TO TRY THIS. THANKS! I think this is a great product! Great review! The pictures you provide are great and very helpful! Looks like this could help with my ankles. The skin is always rough, thick, and tough. No matter how much I scrub, it doesn’t seem to help. I’d like to give it a go. Your review was very thorough, although I’m still just only very, very slightly intimidated as I have extremely sensitive skin. However, the part about the fine tip makes me less reluctant to try this product out. I think it is worth a shot. This Riiviva Microderm could be the answer to some of my skin problems. Sounds like you have some really great results, glad it worked out for you. I hope to try it out for myself soon. What a great review. I would love to try this product as I have multiple skin issues and would benefit greatly. I think this is a very valuable product…. if celebrities can do it so can I.
Wow! This product sounds so safe and natural. Your comments have me so intrigued. I’m wondering how old you are, Irina, because I’d like to compare that to how old I am. No side-affect’s ? Great I would definitely use on my face and hands. Wrinkles be gone ! Hope I win! I’ve seen the infomercial and thought the same thing. Sandpaper! Thanks for the informative review. I’d love to give it a try. You had me at “new skin” and “glowing and radiant”.I would love to have Riiviva for my dry skin especially after seeing the before and after pictures you took.This was an awesome review to awaken me to what this product can do.Now I want to win it really badly.Thanks again. After reading this review I am thinking to myself, “wow I NEED this!” I just turned 30 and my skin is so dull and could def. use an amazing product like Riiviva! Love the review and this giveaway! Goodluck everyone! I really think this could be the answer to my issues. Great review. I think this would be a product I could definitely use as I am 58 and noticing changes to my skin. Wow!! Great review!! This looks very simple quick n with great results!! I would love to try this!! Thank you so much for the chance!! Love the review it sounds like an awesome product and would do wonders on my nose/face and elbows! I have also seen this infomercial. It’s great that you reviewed it and it is what they say it is! I have lots of skin issues and am crossing my fingers that I win this giveaway. ( I’ve never won anything in my life ) lol Thanks so much for sharing the review and doing the giveaway. Great review. I would love to try this product. You’ve done a wonderful job of answering so many of my questions about what microderm is and how it works. Wonderful review! Ooo, that is a good idea to use it on knees and elbows. I was thinking the same thing, that I would probably try a home treatment like this before spending big bucks at a detmatologist. I have thick skin on parts of my face that would provpbably benefit from microdermabrasion. I think its great that they made an affordable alternative in comparison to going to the salon! Sounds interesting. Funny how the demonstrators in commercials for products like these are always people who don’t need them! It’s nice to have a “real person” give an opinion. I would love to win this, as buying one would be just a dream on my disability income. However, if I’m with a friend or relative I can tell them what you said. Good Job! I love the fact that the Home Microdermabrasion Kit completes with three types of diamond tips for face: fine, medium, and coarse! Love it! This looks like an effective tool that I could use. Thank you for the informative review! I have keratosis pilaris. This looks amazing! This product definitely sounds like a winner and like something I really need. I am excited to hopefully try it out as well! This would be so great for my acne scarring, would love to try it! What a great tool go use and save tons of money just doing this in the comfort and privacy of hour own home. Im in!! What a great review, I have never heard about this product before reading this today and I could really use this in several areas of my body such as my elbows, knees and heels and on my face. I think that i could really like it! I have pilar keratosis, too. Great review and especially applicable for that reason. I would love this to work on my elbows. They are so rough and dry that at times they burn and feel like they are going to crack and bleed. Awesome product and awesome review. I really loved the video too. Seems to easy to use. I’m definitely intrigued! Thank you for your honest opinions on this. I would love to tackle some of my problem areas, but I just can’t see going to a salon and having thousands of dollars in work done. This would be a great alternative! this seems like an awesome product, I wanna use it too. Great and thorough review! I was a little concerned, but you answered my questions! I love the before and after pics! Any concerns I might have had have been laid to rest! Thank you! I would love to win so I could try this for myself! Thank you! This looks awesome! I would love to use it on my feet!! This products sound so great. I would love to have it and try it on several areas of my body. I like that there’s different tips for different body parts. I really enjoyed reading your informative review. I wish I were able to afford one of these units, as I am certain it would help my blemishes, and combination skin! I really love this idea of this product! Sounds like it is something I could really use. I’m in my later 30s and have found that my skin has different issues in different areas and this sounds like it would solve them all! My fingers are crossed! Great review! Sounds like something many people could use and it makes it that much better that you can use it at home. Viiviva is an awesome product, good for all different parts of the skin. Love to try it! Wow! I really want to try this machine because I have acne severely and nothing has helped me ever. After reading your review I am sold. Thanks for sharing this awesome review. This seems like one amazing machine. Thanks again. Wow I could definitely use this, would come in handy on this bad skin of mine. Sounds like an amazing product! great review it sounds like a great product and i have had professional and would love a much more affordable option…. sounds very affordable and more convenient definitely wanna try. This product sounds amazing! I sure hope I get lucky and win! Great review by the way! This is great, I love all of the accessories that it comes with and love that you just have to charge it. I hope I win:) I would love to try this and make a big difference in my appearance! This is a NEED TO HAVE TOOL!!!! The different tips are a bonus…. (not just for face!!). Amazing review. I have seen other products quite like this and have gotten a microdermabrasion done once at the spa. It really helps but only if you make it a routine so this cuts the cost but with so many benefits! Can’t wait to try one lol if I win! I think it would be cool just to have ONE Microdermabrasion treatment, but to be able to give myself one on a regular basis would be incredible. Especially to achieve the results that you did with just two treatments on your knees!! I think the difference is very noticeable and amazing! I’m really excited to have the chance to win one. Thanks!! I love the review and makes me want one even more!! I love the fact that it helps with so many different areas and also the fact that it is rechargeable. I think this would be great try on acne scars, I have a lot of scars from cystic acne and this would be awesome to try on it. I read your Review and was very impressed with it. I only wish I had the $300.00 to pay for one, however I don’t. So, my only chance to get one, is to win it, I’m afraid. My.chin could use some love! Wow, what a thorough review! I had my doubts when I first started reading, but you’ve sold me. I’d love to try this on my face and elbows. I also purchased the riiviva dermabrasion and I love it. It truly works. I am 61 and am still fighting the aging process. I first attempted the problem area on my face, very deep grooves in my skin under my lower lip. I figured I’d try the worst spot first. In one month it has made a major difference. Then I worked on the sag of skin under my chin and saw an improvement there. When I did my whole face it left a softness on the skin. Next will be the flab on the upper arms. I recommend this product to anyone who is always looking for self improvements. I’ve been told I look like I’m 45 so I will continue to fight the aging process. Hope you are able to help me. I was wondering what the difference is between the Riiviva and the new Rodan + Fields macro exfoliation, I am interested in purchasing one but I am unsure of which one. I posted the same question on rodan + fields seller’s website, but they deleted my post and my question went unanswered. Hi Estela, Thanks for your question. Unfortunately I haven’t tried the new Rodan + Fields macro exfoliation you referring to. But I use my Riiviva kit once a week for 5-10 minutes and I am happy with the results. Hope this helps. I have the Rodan+Fields Macro Exfoliator. The main difference is that the Rodan+Fields Macro E has an “on-board computer” for lack of a better term. It’s called Doc Smart. Basically the Macro E has a little screen that shows you what area of your face to do and automatically adjusts the suction and the time you use the tool on those areas. The tool will beep when it’s time to move to a different area. It also has an app you can load on your phone to track your results and remind you to use it once a week. Check out the demonstration video youtu.be/73Hyp6xAaGQ. It’s a bit less expensive because it’s sold through independent consultants and it comes with cooling gels. Plus it has a 60 day money back guarantee!